Apostolic See: Title assumed by the Pope intended to call attention to the fact that he claims to be associated with one of the Apostles of Jesus Christ. cannonical law: Religious laws created by church councils (or sometimes by decree of the Pope) are called “cannon” law to distinguish them from laws revealed in the text of the Bible. Catechism: Book of Roman Catholic religious concepts intended to be memorized. diocese, diocesan: geographical districts of church jurisdiction. ecclesiastical tribunal: This is a religious or church court intended to pass judgement on individuals in certain cases such as marriage, divorce, …etc. In Moreno’s Ecuador, the Concordat gave full and final jurisdiction to the church court on many important matters such as marriage, divorce, …etc. requiring the civil authority to enforce such judgements. exequatur: A law or formal legal decision whereby the civil government of a nation permits the laws of the Roman Catholic Church to take effect in its territory. Note that this term has a meaning in civil law (ie outside the church) but it was also used with a special religous/civil definition by the church since the middle ages. 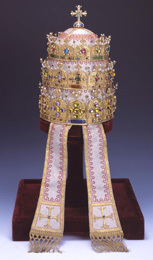 His Holiness: Title assumed by the Pope. Holy See: This is intended as a reference to the Pope himself. Holy Father: This is intended as a reference to the Pope himself. Ordinary: Title associated with various designated church officials at all levels. Seminary: An institution of higher learning for religious instruction of students preparing to become clergy or priests. Supreme Pontiff: This refers to the Pope. This title had its origin in the Pagan Roman Religion; it originally referred to the high priest of the “College of Pontiffs” in ancient Rome. For the President of the Republic: His Excellency, Monsignor Ignacio Ordonez, Archdeacon of the Cathedral Church of Cuenca in the same Republic, etc., etc., and Minister Plenipotentiary to the Holy See. Art 2. In every diocese which exists at present or which shall be created in the future, there should be a diocesan seminary, the supervision, curriculum and administration of which shall pertain freely and exclusively to the diocesan Ordinary according to the rules prescribed by the Council of Trent and other canonical laws. The Rectors, Professors and others taking part in teaching and administering such establishments shall be freely appointed and removed by the Ordinaries. Art. 5. Since the primacy of honour and of jurisdiction in the Universal Church belongs by Divine Law to the Roman Pontiff, the bishops, clergy and laity shall have free communication with the Holy See. Therefore, no secular authority shall have the right to place obstacles to the full and free exercise of the aforesaid communication by forcing the bishops, clergy and laity to act through the agency of the Government in order to approach the Roman See if occasion arises, or by subjecting Bulls, Briefs or Rescripts of the Apostolic See to the Government’s exequatur. Art 7. Appeals from sentences of the Ordinaries to the secular authority (commonly called recursos de fuerza) shall be abolished. As regards the execution of sentences pronounced by the usual ecclesiastical tribunals, it shall be possible to make appeal only to the superior ecclesiastical tribunals or to the Holy See according to the procedure laid down in the Brief Exposicit (May 15, 1572) of the Supreme Pontiff, Gregory XIII, and in conformity with the canonical requirements, particularly those laid down concerning matrimonial cases by Benedict XIV in the Constitution Dei miseratione or, alternatively, it shall be possible to bring a case of nullity or of complaint before the aforesaid superior instances. The ecclesiastical judicial authorities shall pronounce their judgements without previously submitting them to the scrutiny of the lay assesors whom, however, they may consult when they shall believe it necessary. Ecclesiastical Advocates shall be able to exercise the office of assessor in this class of judicial cases. Art. 8. All ecclesiastical cases, especially those concerning Faith, the Sacraments (including matrimonial cases), morals, sacred functions, sacred rights and duties, whether by reason of person or of matter, except more important cases reserved to the Supreme Pontiff according to the decision of the Holy Council of Trent (Sess. 24, Cap. V, de Reformatione) shall be brought before ecclesiastical tribunals. The same rule shall be obeserved in civil cases concerning ecclesiastics and in others regarding crimes included in the Penal Code of the Republic. In all judicial cases which may be within ecclesiastical competence, the civil authority shall furnish all help and assistance to enable the sentences and punishments pronounced by the ecclesiastical judges to be observed and put into effect. Art. 9. The Holy See permits ecclesiastical persons and property to be subjected to public taxation in the same way as the persons and property of the other citizens of Ecuador are subject to it, provided, however, that the civil authority consults the Church to obtain its consent whenever coercion shall be necessary. Seminaries, property and objects directly destined for Divine worship, and charitable institutions shall be exempted from such taxes. Art. 10. Out of respect for the majesty of God, who is the King of kings and Lord of lords, the immunity of religious places shall be respected so far as is compatible with public security and the requirements of justice. When necessary, the Holy See consents that the ecclesiastical authority, parish priests and superiors of the religious houses may, at the request of the civil authority, give permission for refugees to be taken out. Art. 11. As the proceeds of the tithes are destined for the upkeep of Divine worship and of its ministers, the Government of Ecuador binds itself to preserve this Catholic institution in the Republic and His Holiness consents that the Government should continue to receive a third part of the proceeds of tithes. The two authorities (civil and ecclesiastical) shall come to an agreement about the collection and administration of tithes. To this effect, the Government or, failing that, the ecclesiastical authority shall report to the Holy See immediately on the expiring of those periods. The persons presented, however, shall not be able to engage in any way with the discipline and administration of the churches without previously receiving Bulls of canonical institution. In the creation of new bishoprics, the President of the Republic shall, on the first occasion, present the new bishops directly to the Holy See. Art. 12. By virtue of the right of patronage, which the Supreme Pontiff conceeds to the President of Ecuador, the latter shall be able to propose suitable priests for the archbishoprics and bishoprics according to sacred canonical procedure. To this end, when a vacancy in an episcopal See has occurred, the archbishop shall ask for the votes and opinions of the other bishops for the filling of the vacancy; if the archiepiscopal See shall fall vacant, the senior bishop in that region shall collect the votes and shall present a list of three candidates at least to the President, who may choose one of them and present him to the Supreme Pontiff for the conferring of canonical institution according to the form and procedure prescribed by the sacred Canons. In a case where presentation by the bishops is not made within six months, whatever may be the reason, the president of Ecuador shall have the authority to act by himself and if he shall have taken no action within three months, the election shall be reserved to the Holy See, as the President himself has requested. To this effect, the Government or, failing that, the ecclesiastical authority shall report to the Holy See immediately on the expiring of those periods. The persons presented, however shall not be able to engage in any way with the discipline and administration of the churches without previously receiving Bulls of cannonical institution. In the creation of new bishoprics, the President of the Republic shall, on the first occasion, present the new bishops directly to the Holy See. Art. 13. Similarly, His Holiness concedes to the President of the Republic the right of naming suitable ecclesiastics to benefices of a Cathedran Chapter or to offices, canonries or functions therein with the exception, however, of the highest dignity which shall be at free disposal of the Holy See, and with the exception also of pre-bends which are not part of the concursus, namely those falling vacant in the months of March, June, September and December; these shall be at the free disposal of the bishops. The offices of Doctor, Penitentiary, Professor and the rest of the concursus shall similarly be provided for by the bishops only, after they have made examinations according to canonical requirements. Finally, if in any Chapter there should not exist the number of Chapter members fixed in the Bulls of creation of the respective dioces, the bishop shall be entitled, immediately or when funds shall be sufficient, to create the benefices which are lacking, and provision to them shall be made in conformity with the procedure set forth in the present Article. Art. 14. With respect to the provision to parochial benefices the Ordinaries, in compliance with the rules laid down by the Council of Trent, shall present to the Government a list of three suitable ecclesiastics, on one of whom the parish may be conferred; the President, whether directly or by the agency of his delegates in the provinces, shall choose one of these three. In a case where the Government for special reasons should demand a further three candidates to be proposed, the Ordinary shall have the authority to provide such a list, on condition that it shall in no way be possible to reject this second list. If it becmes necessary to make territorial divisions of parishes, this can be done by the bishops in consultation with the local civil authority. Art. 15. During the vacancy of an episcopal church, its Chapter shall freely elect a Vicar Capitular, within the time and according to the form prescribed by the Council of Trent, without it being possible for any one to reverse this election, once it has been made, or to proceed to another one; any custom, however ancient it may be, and of whatever kind it may be, which would be contrary in this respect to the enactments of the sacred Canons is hereby completely over-ruled and utterly abolished. Art. 16. The Holy See, in exercise of its particular prerogative, shall create new dioceses and shall make new delimitations in those at present existing; and taking into account the present extent of the dioceses among which the Republic is at present divided, the Holy See will, immediately on ratification of the present Concordat, confer on its own special delegate the necessary powers to proceed in consultation with the Government and the respective bishops to the territorial demarcation of the dioceses which can be conveniently created and to fix the endowments and salaries of churches, bishops, chapters and seminaries. Art. 17. The executive decree of May 28, 1836, on the abolition of taxes imposed in favor of the Church, shall itself be abolished; and the Holy See in view of the usefulness which will result from the present Concordat, and desiring to provide for public tranquility and to remedy the evils caused in the country by the transfer of these taxes to the National Treasury, and acceding to the repeated requests of the President, decrees and declares that those persons who, during the period which has elapsed from the year 1836 until the present, shall have made or promoted such transfers, as also owners of the funds which have been acquired in this way and those who have in any way succeeded to the possession of the same, shall not receive, at any time or in any manner, the slightest molestation on the part of His Holiness or of his successors as Roman Pontiffs. Art. 18. With regard to the obligations contracted by the Government with its creditors because of the taxes transferred, the Holy See allows that by payment of a tenth part (or less if the ecclesiastical Ordinary agrees) of both the capital transferred to the public treasury and also of the interest gained, the Government shall be free of all responsibility. For security of payment of this amount, the Government shall assign to it a fourth part of the third which it shall receive from tithes; this shall be placed in the hands of the Ordinaries in order that it may be divided by them in proportional parts among their bona fide creditors, care being taken that the principal is capitalized in a secure and productive manner. In the future it will not be permissible for any possessor of taxable goods to transfer to the public Treasury the required capital, and those who shall try to free their assets from the taxes imposed on them, shall not be allowed to do so in any way without the previous consent of the respective Ordinary and by handling the required capital to the Ordinary by whose permission it may be submitted in case of necessity to a wise and equitable reduction; it being understood however, that in every case due regard must be paid to the interests of the Church. Art. 19. The Church shall enjoy the right of acquiring freely and by any legitimate title both the properties which it now possesses and those which it may possess in the future, which shall be guaranteed to it by the law. The administration of ecclesiastical goods shall be entrusted to persons designated by the sacred Canons, who alone shall examine the accounts and economic regulations. Goods of ecclesiastical foundations, of whatever type they may be, which belong to hospitals and other charitable institutions and which are at present not administered by ecclesiastical authority, shall be restored to it, so that without delay it can assign those goods to their rightful purpose. With regard to both old and new ecclesiastical foundations, no suppression or union shall be possible without the intervention of the authority of the Holy See, except for the powers belonging to the bishops according to the Council of Trent. Art. 20. In addition to the religious Orders and Congregations at present in existence in the Republic of Ecuador, the diocesan Ordinaries shall be able, freely and without any exception, to admit and establish in their respective dioceses new Orders or Institutes approved by the Church in conformity with the needs of the people; to this end the Government will lend its support. Art. 22. The Government of the Republic of Ecuador binds itself to provide all possible means for the propagation of the Faith by the conversion of pagans living in its territory; and to supply every assistance and help to the establishment and progress of the holy missions, which have been sent by the authority of the sacred Congregation for the Propagation of the Faith for this praiseworthy purpose. Art. 23. Other matters pertaining to ecclesiastical property or persons, of which no mention has been made in the Articles of the present Concordat, shall be regulated and administered according to the Canonical discipline existent in the Church and approved by the Holy See. Art. 24. By virtue of the this Concordat all laws and decrees published hitherto in whatever manner and form in Ecuador are revoked in the respects in which they are contrary (to the Concordat); and the aforesaid Concordat is always to be considered as a perpetual law of the State. Therefore, each of the Contracting Parties binds itself, on behalf of their respective heads and their successors, to loyal observance of all and sundry of the component Articles. If in the future, any difficulty should arise, the Holy Father and the President of Ecuador shall confer with each other to obtain an amicable settlement. Art 25. The ratifications of the present Concordat shall be exchanged within a period of one year, or sooner if possible. Giacomo Cardinal Antonelli. Ignacio Ordonez.